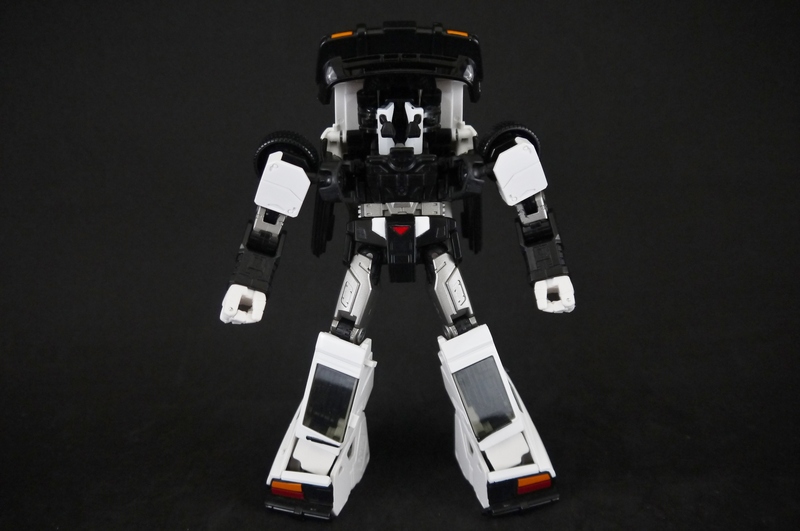 Optimus Prime’s faithful second-in-command, Prowl, in all of his updated Masterpiece glory. 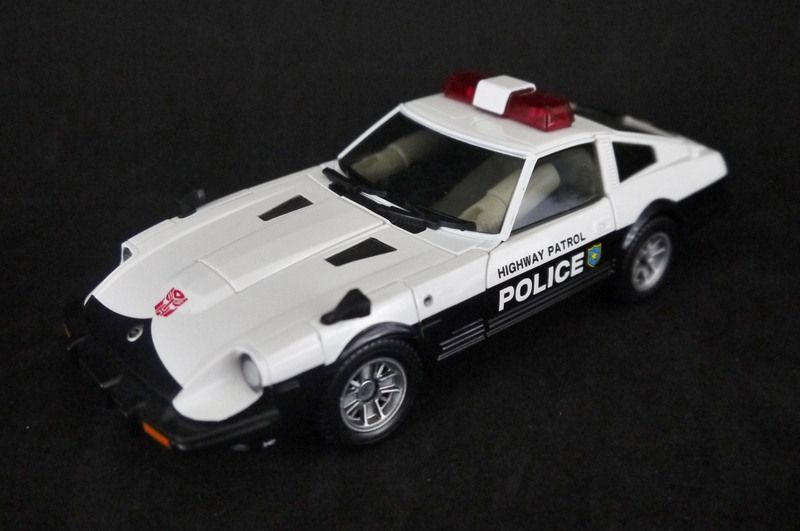 This would be my first Masterpiece Autobot car, as many more are on the way, along with the various redecos already released. 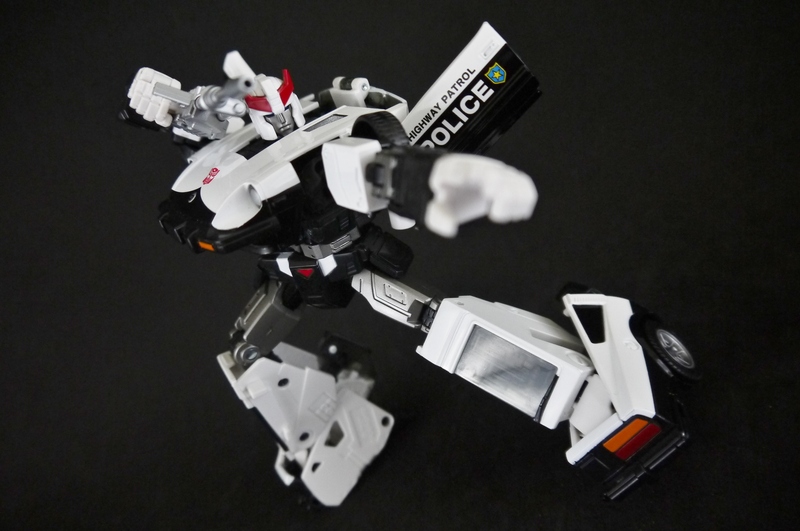 I picked Prowl up at Robo Toy Fest in December of 2013 and had a little blurb on him there, including the price point I snagged him for. 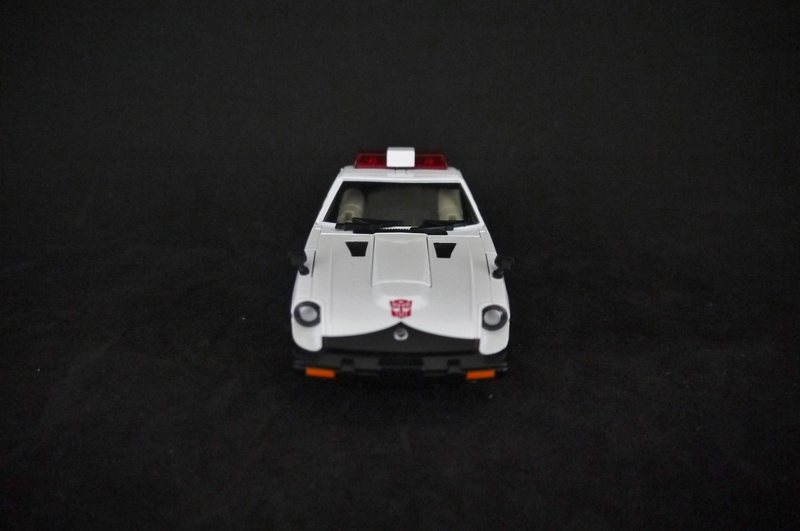 I actually picked up Prowl before Sideswipe, though I do own the latter now. As such however, I’ll be reviewing my Masterpieces mostly in their order of acquisition, so the Sideswipe vs. Prowl comparisons will come during Sideswipe’s day in the limelight. 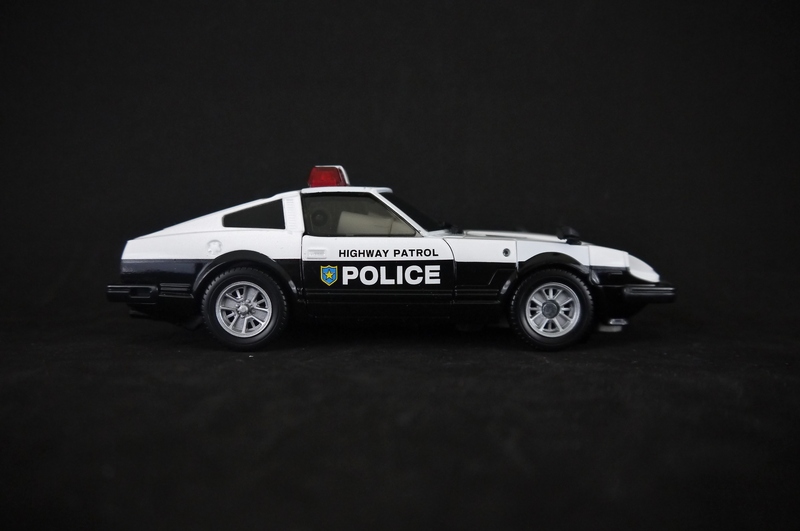 Starting with Prowl’s vehicle form, that of a beautifully rendered Nissan Fairlady 280Z-T. This is actually a licensed Nissan product, so we get a nice little Nissan Z emblem on the tip of the hood. 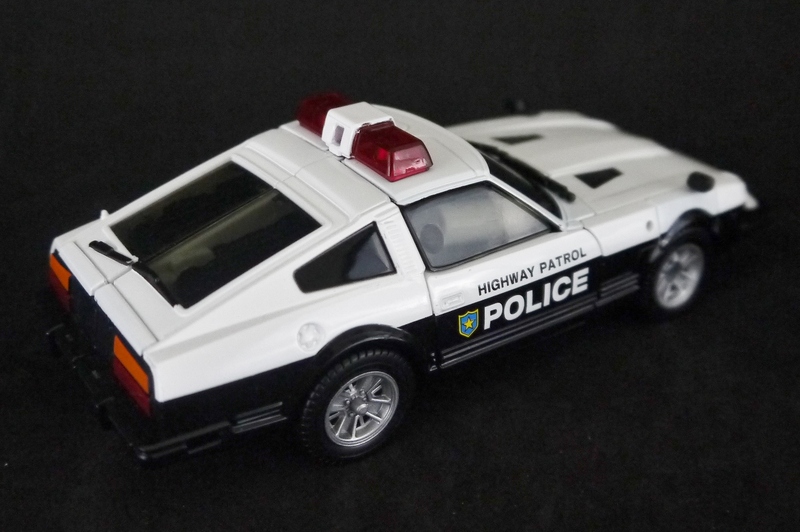 I’m thoroughly impressed with how realistic the vehicle form is, as expected of the Masterpiece line. Beyond just loving the aesthetics of the car in general, I’m very impressed with the overall sturdiness and attention to detail on this thing. Everything just screams quality; I suppose this is where the hiked price point comes from. The paint is superb and even, along with sturdy. I haven’t really had anything chip or break, it all still looks great. Despite a few bits being visible through the windshield and windows, this does legitimately look like a model car. 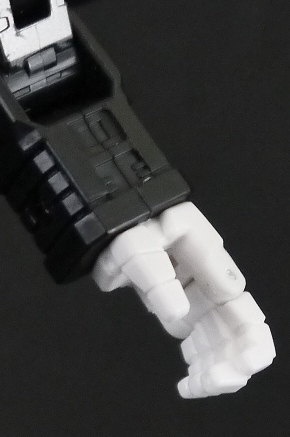 The transformation seam-lines are there, but notably toned down so that it wouldn’t appear obvious to someone unfamiliar with Transformers that this thing actually turns into a robot. 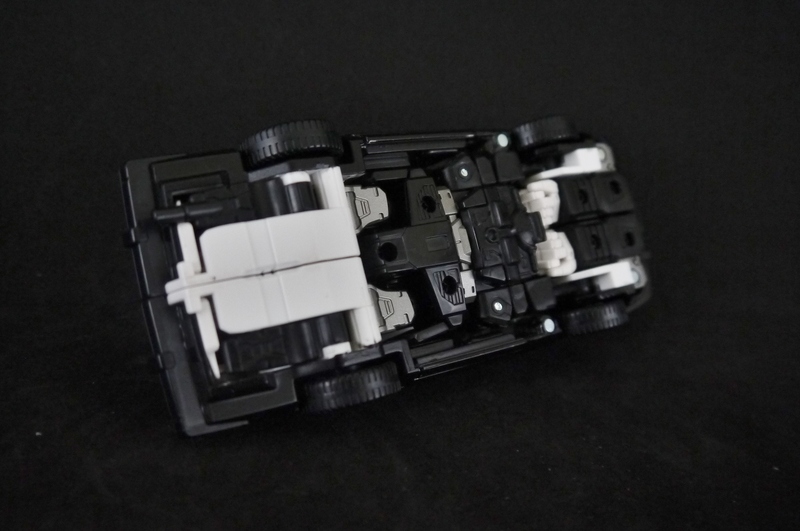 The underside, with no real kibble, since everything in vehicle form looks pretty compact and streamlined. Complete with a little exhaust port back there too. The hands are clearly visible near the front, with the “diaper” shape of the waist also distinguishable. 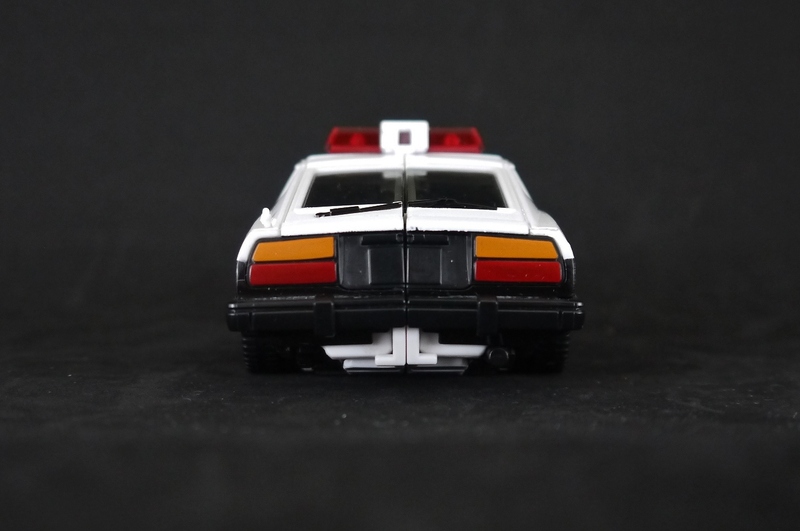 How the Autobots do law enforcement. 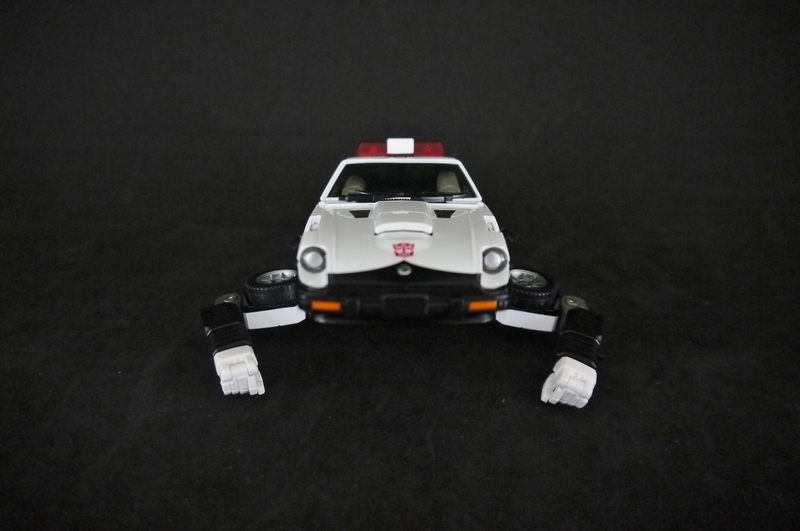 Prowl’s transformation is fairly complex, though enjoyable all the same. The legs can be a bit tricky. 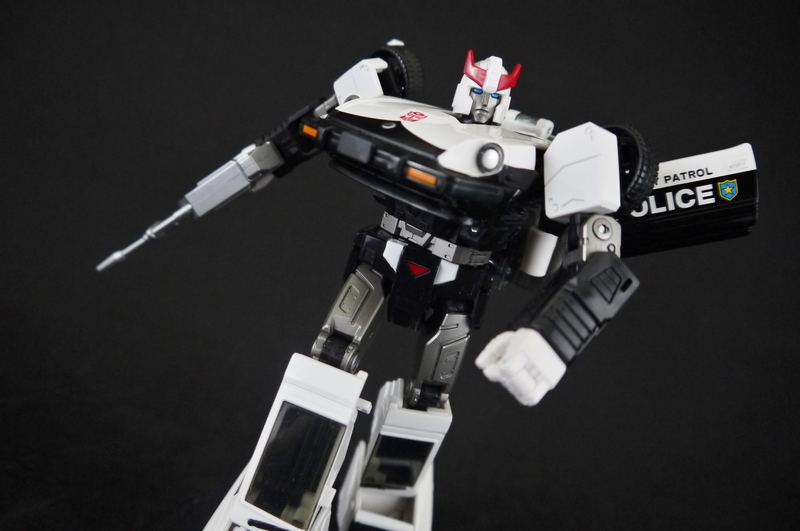 I was actually unable to transform my Prowl right out of the box – I had been stuck with a manufacturer defect! One of the side-view mirror panels that were supposed to fold into the underside of the torso was actually glued together. Something apparently went wrong, because one mirror could move and the other had a thick crust of glue over it. I had to go home and take an exacto-knife to clear away the mess. 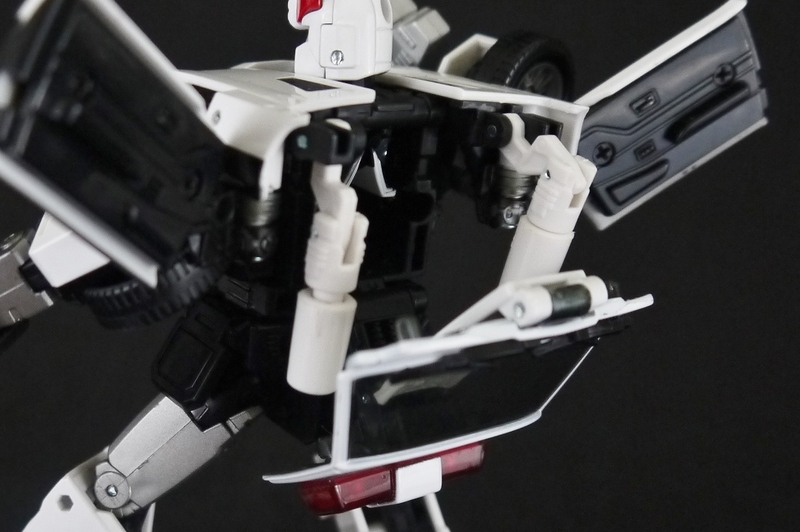 Thankfully it worked, and Prowl transforms just fine with no other defects now, but that little bit scared me to death. I’m absolutely loving the robot aesthetics. Simply beautiful. 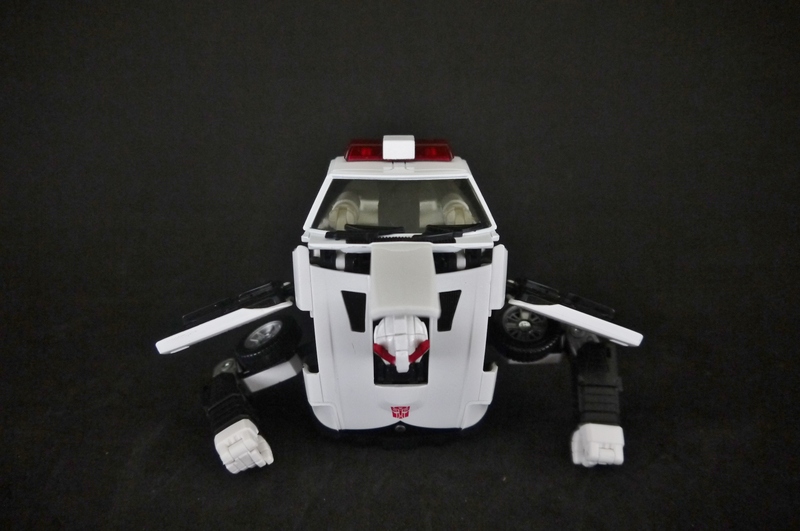 Prowl has distinctive Transformer proportions, with the big car front as the chest and the blocky feet. It feels nostalgic as a G1 toy with vastly updated modern figure technology. I’m especially fond of the face sculpt – it’s just a regular neutral expression, but the painting for the head crest and eyes are clean and vibrant. The same extends to the rest of the figure. 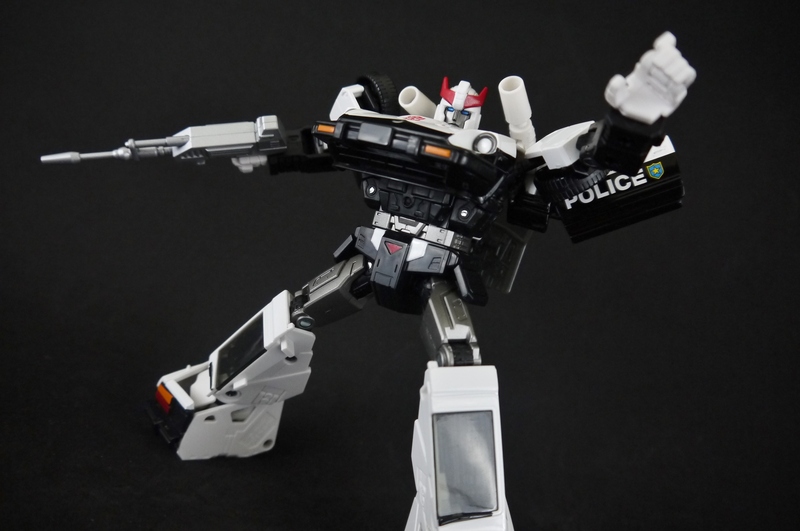 Prowl keeps the quality bar high in articulation. This is honestly one of the most free-moving transformable Transformers I’ve ever experienced. 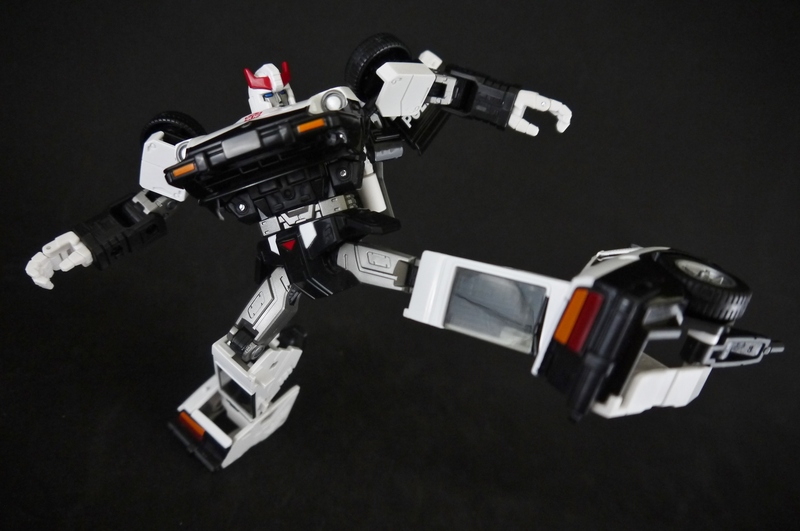 Despite the fact that it needs to change into a life-accurate vehicle, Prowl maintains an almost completely free range of movement in his limbs. 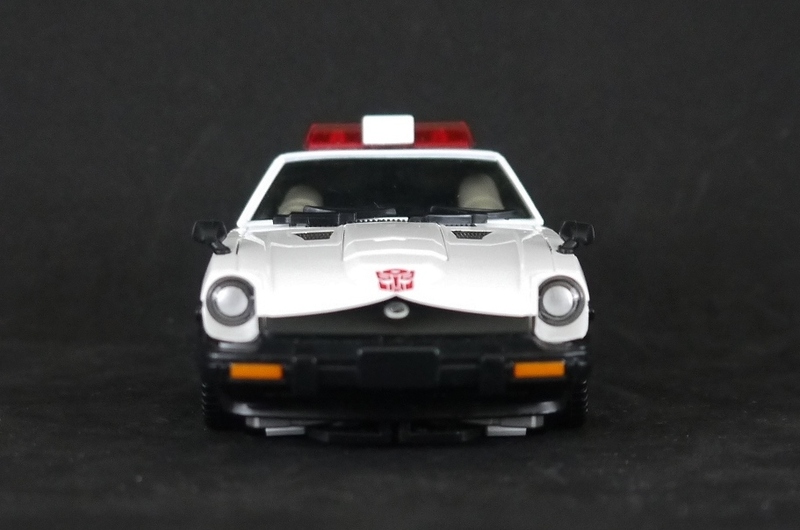 Given that this was my first Autobot car, I fully expected the smaller size to yield some boring ‘ol peg hands. Thankfully I was proven wrong. While not as articulated as MP-10’s hands, these scaled down manipulators still feature opening fingers, though no articulation in the thumb. It’s not actually much, but it’s world’s better than the plain molded hands with gaping holes in them. 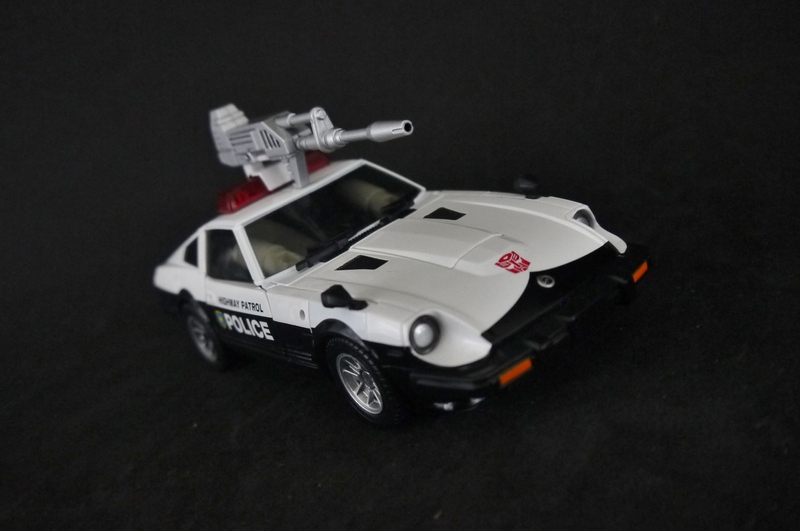 Prowl’s only accessory is a single semi-automatic rifle (as dictated by the instruction booklet – I don’t know if that’s actually what semi-automatic rifles look like). Most of it comes painted in a nice even silver, while the handle alone is molded in white. As I mentioned earlier, the handle can rotate from biped-form wielding mode to vehicle-form attachment mode. 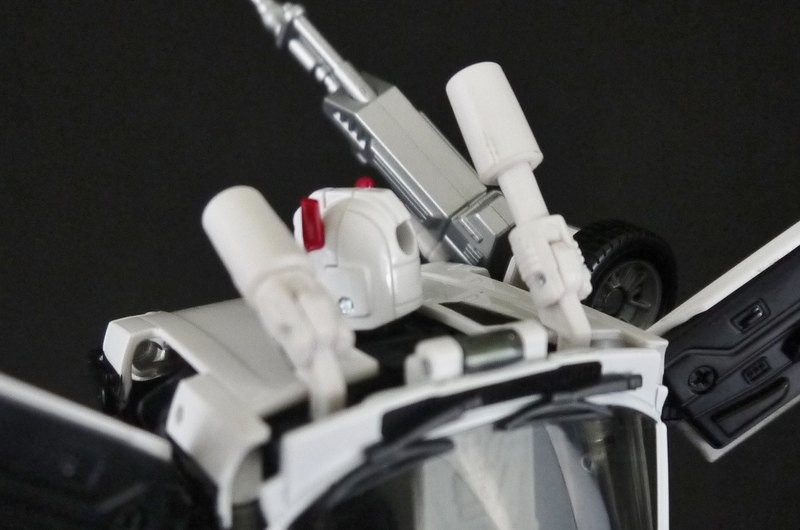 What’s nice is that the gun is actually secured in Prowl’s grip; the handle has a peg while the palms have grooves that allow the weapon to be tabbed in with the fingers wrapping around it. 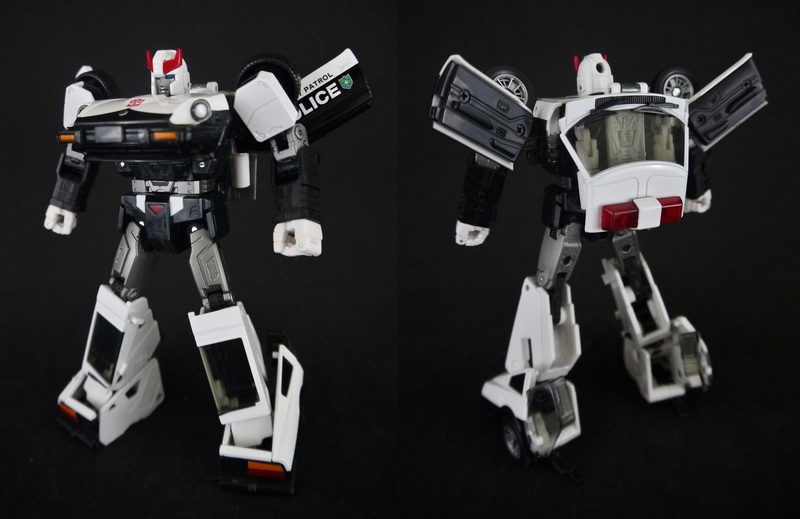 Aside from the semi-automatic rifle, Prowl also has two smaller weapons stored in the back, which can flip up and out. Not gonna lie, the shoulder cannons are a bit too dinky and tiny for my taste, but they are a welcome little bonus. They’re capable of extending, though not really by much to make a difference. Just a little hard to pose with. 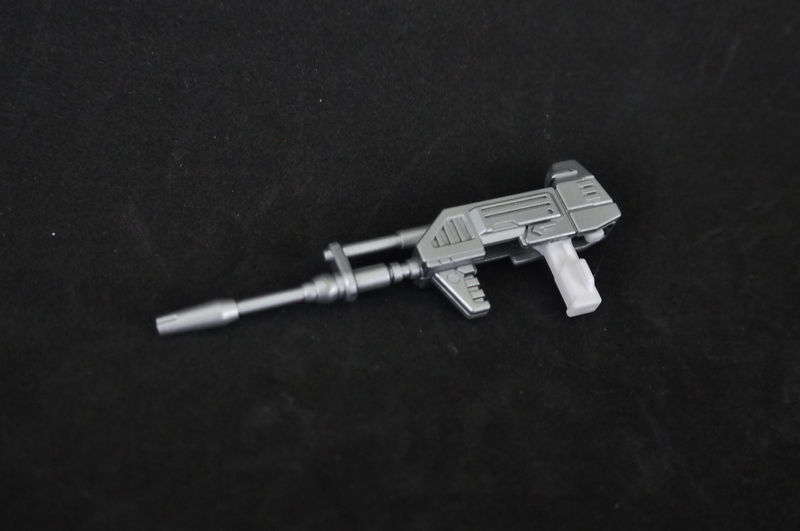 As I understand it, there is an optional cannon attachment that’s more akin to Prowl’s original G1 toy appearance, but it’s nice that Takara managed to fit these in the figure at all. While I had my doubts about these newer Masterpieces because of their scaled down size and lack of die-cast metal, I have to say now that they’re well worth the hefty prices they fetch due to their engineering and quality alone. 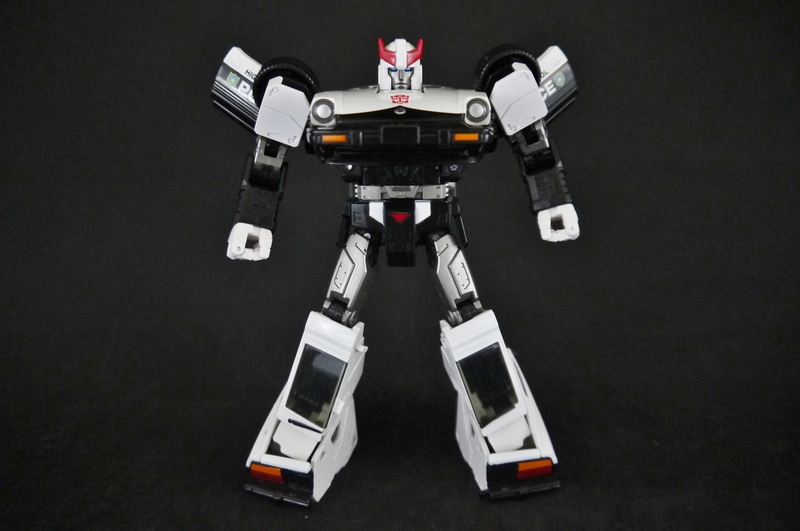 Prowl is quite a superb rendition of his classic G1 self, with all the latest Transformers engineering marvels and articulation that we’ve come to expect from the Masterpiece line. I can’t really point out any serious flaws here – this figure is what I expected and more.